Despite a standardized uniform for this subculture, one small detail of this Hacker Uniform has remained unresolved for decades. Are one-hole or three-hole balaclavas best for hacking? Which balaclava is best for stealing bank accounts and hacking into NASA computers? What offers the best protection from precipitating ones and zeros in a real-life Matrix screensaver? 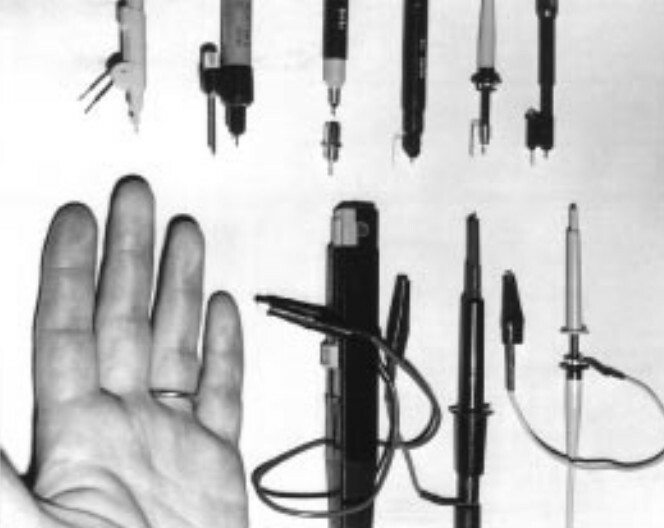 A selection of probes, from [Jim Williams’] Linear Technology app note 72. It’s not often that we are shown an entirely new class of test equipment here at Hackaday, so it was with some surprise that we recently received the new O-scope Mayer offering. If your most simple piece of test equipment is your own finger, able to measure temperature, detect voltage, and inject a 50 or 60 Hz sine wave, then what they have done is produce a synthetic analogue with a calibrated reading. The idea is that where previously you could only say “Too hot!”, or “High voltage!”, you should now be able to use their calibrated probe to gain an accurate reading. The O-scope Mayer D4/WG5 Calibrated Fleshy Test Probe is a roughly 4″ (100mm) long cylinder of their InteliMeat™ synthetic finger analogue terminated with a calibrated matching unit and a BNC socket. In the box aside from the instruction leaflet is a BNC lead through which you can connect it to your oscilloscope.